Although my recent beach hunting trip to the Gulf Coast wasn't a stellar success, my new Garrett All Terrain (AT) Pro detector shined brightly just the same. Here's my rundown on this machine. First off, I've been a Garrett user for many years. Nearly four decades in fact. 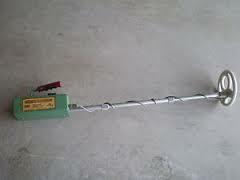 My only veering away from the Garrett metal detector line took place back in the 1990s when I bought a Whites "Goldmaster" and later on when I went with Fisher's "Gold Bug" series of machines (Gold Bug 2 and Gold Bug Pro). Detector technology has undergone remarkable changes over the course of my mining and treasure hunting career and the Garrett AT Pro is a solid manifestation of that fact. This machine is a far cry from my first Garrett, a beat frequency oscillator (BFO) that I swung in my early days in the field. Back then I couldn't have imagined a machine like the AT Pro. By the way, the very first day I used that old BFO I recovered a 14k woman's engagement ring with diamonds! It was a very simple machine, that BFO. I dug lots of trash with it but I also made some very good recoveries before I retired that old work horse. The AT Pro is obviously more complex in its circuitry and capabilities than that old BFO, but Garrett has designed it so it's quite easy to use. Like most detectors today the AT Pro has a visual display indicator (VDI) that provides a reasonably accurate response in identifying targets and their depth. However, being old school, I only use VDIs as adjunct "helpers" to the sound a target makes. With older detectors like the BFO, learning the sound that various ferrous and non-ferrous targets made was a must since there was no VDI screen back then...just a meter and needle. This said, the AT Pro's VDI was pretty darn accurate. One thing you might want to know is that pull tabs and metal bottle caps will read as "good" targets on the AT Pro's VDI which uses a numerical scale highlighted with symbols or coin values for identification purposes. Pull tabs read in the gold (jewelry) range and bottle caps up in the coin range, although if you listen closely the latter items will create a "sputtering" or "grunting" at the end of a coil sweep. This is nearly always a giveaway that the target is ferrous (contains iron). Still, I recommend you dig any and all targets that sound "good." Otherwise you might pass up a nice gold ring find. One thing I really like about the AT Pro is its ease of set up. You can choose various hunting modes including custom, coins, or zero. The coin mode is recommended for first timers or those without a lot of detecting experience. Ground balancing is a dream with the AT Pro...just depress the ground balance button and pump the coil up and down just above the ground you're working and voila! Instant ground balancing. This is a great asset for beach hunting (as well as other terrain types) because salt water and black sands used to be the bane of older detectors including the Garrett I swung back in the 1980s while beach hunting. The AT Pro handled the beach like an old pro (pun intended!). Oh? Did mention the fact that the AT Pro is fully submersible in water up to a depth of 10 feet? Yep. However, if you're planning on working underwater with the AT Pro, make sure your headphones are also waterproof! The AT Pro also has a very good "push button" pinpointing capabilitythat can be a great help at times in recovering targets. It also has a factory preset 40-point iron discrimination button that can be changed manually as well by pushing a button. The AT Pro comes equipped with non-waterproof headphones and a 8" x 11.5" DD submersible coil. However, while hunting the beaches in Port Aransas, Texas I found myself wishing I'd brought along a smaller coil for the AT Pro. This would have helped tremendously in dealing with the significant amounts of trash underneath the beach sands there. Oh well...20/20 hindsight, right? As a beach hunting machine the AT Pro performed admirably and I suspect the same will be true when I use it for my other treasure hunting activities. 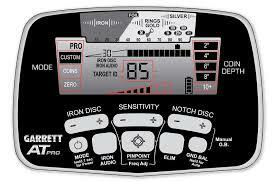 For a mid-priced machine ($500.00-$600.00) the AT Pro is an excellent buy. It performs as advertised and is lightweight enough that you can swing it for hours without turning your arm into a wet noodle. All in all, I like this machine. 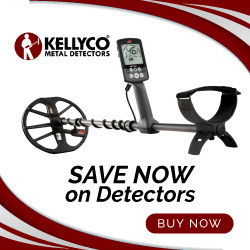 It was the right buy for me and reaffirms my trust in Garrett metal detectors. Let me know if you have any questions about the AT Pro. I'll be glad to answer them for you. Then again, I always have high hopes of things I want to do, but it never seems to work out. Keep hoping and never give up despite the results Gary.